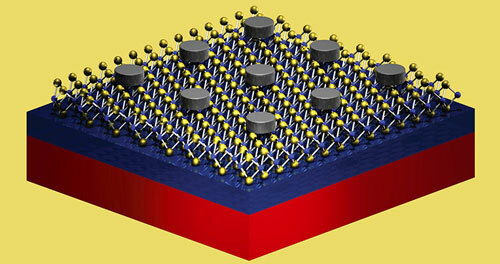 (Nanowerk News) The promising new material molybdenum disulfide (MoS2) has an inherent issue that's steeped in irony. The material's greatest asset--its monolayer thickness--is also its biggest challenge. Monolayer MoS2's ultra-thin structure is strong, lightweight, and flexible, making it a good candidate for many applications, such as high-performance, flexible electronics. Such a thin semiconducting material, however, has very little interaction with light, limiting the material's use in light emitting and absorbing applications. "The problem with these materials is that they are just one monolayer thick," said Koray Aydin, assistant professor of electrical engineering and computer science at Northwestern University's McCormick School of Engineering. "So the amount of material that is available for light emission or light absorption is very limited. In order to use these materials for practical photonic and optoelectric applications, we needed to increase their interactions with light." Aydin and his team tackled this problem by combining nanotechnology, materials science, and plasmonics, the study of the interactions between light and metal. The team designed and fabricated a series of silver nanodiscs and arranged them in a periodic fashion on top of a sheet of MoS2. Not only did they find that the nanodiscs enhanced light emission, but they determined the specific diameter of the most successful disc, which is 130 nanometers. Silver nanodiscs on monolayer molybdenum disulfide. "We have known that these plasmonic nanostructures have the ability to attract and trap light in a small volume," said Serkan Butun, a postdoctoral researcher in Aydin's lab. "Now we've shown that placing silver nanodiscs over the material results in twelve times more light emission." The use of the nanostructures--as opposed to using a continuous film to cover the MoS2--allows the material to retain its flexible nature and natural mechanical properties. Supported by Northwestern's Materials Research Science and Engineering Center and the Institute for Sustainability and Energy at Northwestern, the research is described in the March 2015 online issue of Nano Letters ("Enhanced Light Emission from Large-Area Monolayer MoS2 Using Plasmonic Nanodisc Arrays"). Butun is first author of the paper. Sefaatiin Tongay, assistant professor of materials science and engineering at Arizona State University, provided the large-area monolayer MoS2 material used in the study. With enhanced light emission properties, MoS2 could be a good candidate for light emitting diode technologies. The team's next step is to use the same strategy for increasing the material's light absorption abilities to create a better material for solar cells and photodetectors. "This is a huge step, but it's not the end of the story," Aydin said. "There might be ways to enhance light emission even further. But, so far, we have successfully shown that it's indeed possible to increase light emission from a very thin material."